If I could bring you a tool that allows you to plan and execute your enterprise’s projects more reliably, then you would crown me king. It’s a rare enterprise transformation project that concludes on-time and within budget, let alone with the intended benefits fully delivered. I call myself an expert in this area, because I’ve run several of them, but sometimes I think ‘survivor’ would be a more appropriate title. Every one of these projects has twists and turns: mistakes, drama, politics and other shenanigans. It took me a while to understand that it’s not me; I share this experience with the best in the industry – and I suppose if it was easy, it wouldn’t pay well! So we’re all very interested in improving our ‘game’. What can we do to improve the experience of enterprise transformation projects for both the team and its client? This Hack helps you plan, manage and execute projects and processes. One area that attracts my attention is project planning. There is the de facto standard tool, MS Project, which I’ve been using for some 20 years, and which I think is an abomination. The list of problems with MS Project is endless, and best left for another article, except to say that LiquidPlanner addresses some of the issues. LiquidPlanner is a collaborative planning and management platform for delivering projects – though I believe it would be equally at home delivering processes. It’s about as close to MS Project as a horse is to an SUV. To switch from one paradigm to the other requires a considerable mind-shift, but the shift is in the right direction. And there’s the rub: I’ve been evaluating LiquidPlanner for several years now, with the intention of deploying it, but I’ve never managed to make the jump. It’s a move in the right direction, but for me, it’s never quite made it to the destination. Yet I still love the hack! At its heart, LiquidPlanner is a probabilistic scheduling algorithm – that’s right, there is the embedded assumption of uncertainty in planning. Hurrah! When you create a task, you give it an upper and lower work estimate (with 80% certainty). Dependent tasks are then use this uncertainty as their start date, and their own uncertainty gets factored in, to calculate their expected completion date, and so on and so forth. Here comes the collaborative bit: When members of the team do work on a task, it is deducted from the outstanding work, and your estimated delivery date moves closer. If the team members don’t do the work (or fails to log it), your estimated delivery date slips forward at the rate of 1 second per second…so your entire project is being re-planned continuously! Does this approach give you better estimates of project delivery dates than old-school deterministic scheduling? Yes, a bit, but the main thing it does is change the way you think about the project and its anticipated delivery date. The feature that drives improved scheduling is the engagement of the team in planning and managing their work – the can extend a tasks outstanding work, at the same time as recording work done on it. So this comes with the downside that you are not ‘tasking’ your team, they are tasking themselves. And if you think that goal-setting works (and I’m convinced it does – I’ll refer you to Locke and Latham’s studies in the 1980s), there’s a lever you are losing. Another massive innovation of the LiquidPlanner platform is ‘implied dependencies’. Tasks allocated to resources are listed in priority order, so that you don’t need to string tasks together with dependency spaghetti. This makes plan maintenance a lot simpler. The only time you need a dependency is where the flow of a project changes resources. Using LiquidPlanner in earnest, I also came to understand that resources could complete work on any task, not just in priority order, so in case there was something stopping them, they can work on something else (just like in real life!). 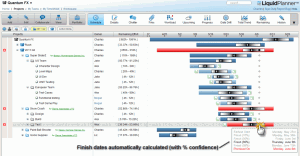 The planning and management interfaces of LiquidPlanner are Gantt-like, but they aren’t Gantts. In some ways the familiarity works against you, as it makes it harder to drop your old school thinking. Tasks can ‘appear’ completely out of order – this happens when they are allocated to a more available resource – but they’re not: priority lists are personal (dependencies are not), and scheduling takes place on a personal availability basis. There’s a more than adequate document management approach provided with LiquidPlanner, where files can be attached to tasks. There’s also discussion tools for group participation; I’m sure that these are tremendous when fully adopted, but I can’t see my peers letting go of email for some time to come. Big picture, outside-in planning. This isn’t a criticism of LiquidPlanner, but of the whole of project planning for enterprise transformation. It’s rare that we plan projects from the ground-up on a task-by-task basis. We have come to understand that this seriously underestimates project duration and resourcing. Even when we estimate outside-in we get underestimates, mainly because there is no proper benchmarking of enterprise transformation going on. There needs to be some serious thought put into bridging the gap between benchmarks and tasks. The psychologists have identified ‘Planning Bias’; somehow we need to mitigate it. 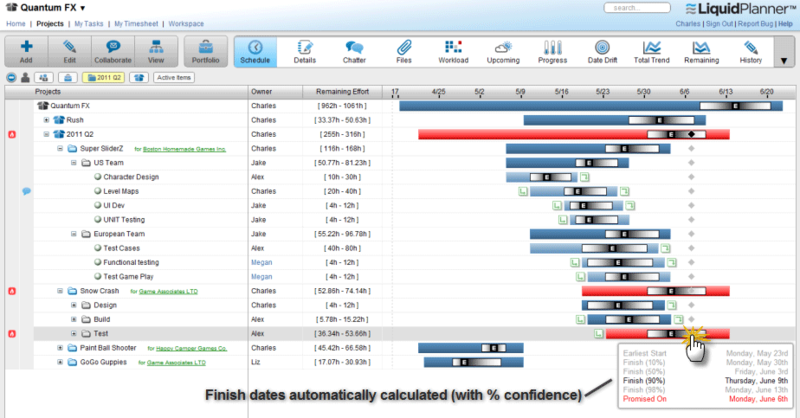 Back to LiquidPlanner: Baselining seems to be absent, so to tool doesn’t support cost estimation and change management. Tasks are allocated to a single resource (I suppose it could be a logical resource too). This could make plans very complicated at times when activities are completed through workgroups. I’ve identified two bits of key functionality missing, that I believe are on the roadmap at the moment: repetitive tasks and dependency delays. At the moment, you can only schedule resource breaks individually (ie. holidays) or for the whole user base. The notion of grouping resources seems to be absent. I’d also like to tool to suggest that you insert a dependency when you re-allocate a task to another resource; because of the implied dependency approach, you can seriously mess-up your project plan if you forget to insert one where it is necessary. I want this tool to succeed. It’s a paradigm-shift in project planning and management, and it’s a brave and well imagined step forward. I’m still looking forward to an opportunity to implement it, but there are some impediments. It’s very nearly ready for prime time use – though it’s felt that way for a couple of years now. There’s a free trial period for evaluation, but it’s a collaborative tool, so you won’t really get to grips with it unless you have a half a dozen people participating in your experiment. I see two barriers to adoption: The first is that there is a per-seat price of around $25 per month, so if there is an existing investment in MS Project, it’s going to be a hard sell. The second is that all the users will require training – and because it’s a paradigm shift from the convention method, this is not a trivial task: There is unlearning to do as well as learning. I’ll say it again: I want this tool to succeed: Vive la révolution! I think better than any tool is experience.. Tools require inputs.. people's inputs … Only people know what cause delays; what is unncessary, what requires a shortcut and what requires throughness and detail.. Even with the best tools.. projects will still be late and run over budget.. unless those who implement them know what they are doing..